A 71 year old man named Anna Hazare has decided to fast unto death unless government rectifies and gives more teeth to a bill called Lokpal bill ,do we really care?? Many people start fasts these days,they go on strike for every possible reason,there are dharnas everywhere so whats so special about Anna. First of all who is Anna Hazare : Anna is a social activist of wide acclaim,he was awarded both padmabhushan(1992) and padmashri(1990) among various other awards. He served in Army and later became a social activist. He is known to be a man who can think far far ahead of most of us. He converted a village Ralegan Siddh to a model village which is a model of environmental conservation. Most notable about this village is that the entire village is powered by solar power. So What is anna fighting for. 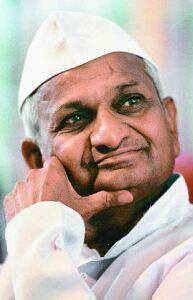 Anna Hazare is fighting to give Indian population the legal muscle to wipe out corruption. He is fighting to give more teeth to a bill called Lokpal bill which has been hanging in parliament for more than 40 years chiefly because it will give us the power to bring to justice the corrupt politicians ,hence they never let it pass. 1. Lokpal will have no power to initiate suo moto action or receive complaints of corruption from the general public. It can only probe complaints forwarded by LS Speaker or RS Chairman. 3. Lokpal will not have any police powers. It can not register FIRs or proceed with criminal investigations. 4. CBI and Lokpal will have no connection with each other. 5. Punishment for corruption will be minimum 6 months and maximum up-to 7 years. 1. Lokpal will have powers to initiate suo moto action or receive complaints of corruption from the general public. 2. Lokpal will be much more than an Advisory Body. It should be granted powers to initiate Prosecution against anyone found guilty. 3. Lokpal will have police powers. To say that it will be able to register FIRs. 4. Lokpal and anti corruption wing of CBI will be one Independent body. 5. The punishment should be minimum 5 years and maximum up-to life imprisonment. Anna is doing it Gandhi style, a very civilised and peaceful protest. No blocking trains,no burning buses ,no violence . And at last ,if Anna looses this time ,we can safely say bye bye to lokapal bill for another 40 years. Politicains would never pass a bill that would make it easier for us to bring them to book ,it will take people like Hazare to build up a movement to force them and sadly we don’t see likes of him very often(also see How this is a leaderless movement). If hazare looses today ,nothing changes,yes nothing changes for you or me. We will still live the way we live,keep cribbing about corruption in India,red tap-ism and bureaucracy but if he wins it will be a huge step to a better India .An India with no corruption,an India where even the Prime minister would be afraid of taking any bribe ,an India where the public servants will finally be accountable to the public ,the way it should be. An India of our Dreams…. its really great that a 70 yr old man,is followed by millions of Indians.y cant the congress govt,if its pure y cant it pass this great bill which will change the face of India.now its the time for he congress govt to prove itself. Well my beleif here is a little diffrent. He cannot fight everythin…but again if we look at the Lok pall bill it has got merits. The movement needs our support more than ever. We can support anytime we want. Just support him because he is not doing this for himself,this is for every each person living in India.I will support him as i feel that all indian should support him,All the things which is happening with in this age is totally wrong,we should not take it wrong,we should think that in this stage of age see how he is fighthig for us. can we take the help of munna bhai giri to support Anna Hazare. Thats a great IDEA,..Sadly whatever we send to PM never eraches them…. LOKPAL BILL WILL HELP TO FUTURE GENERATION WHOM SOEVER MAY BE TO HAVE FREE SOCIAL LIFE AS IT WILL HELP TO REDUCE TREMENDOUSLY VERY LOW CORRUPTION IN ALL FIELDS OF GOVT. OR PRIVATE SECTORS. Gandhi is still living in this Ghandhi Desh? When these politicians makes non sense that is affecting full mass of the country. How do you say Honourable Thief? Diplomatic Thief means Honourable? They are making money to stand for elections? Good politician should work for the country not for his pocket? Anna has completed 11th day if his fast,he is without food for 11 days for whoom for the public of India,we are simlpy watching anna on television since 16th August.He is not showing the Physical pain he is facing.But i urge every Politician citing in the assembly to assume themseleves at anna’s place and then think.I listened Mr. Khurshid’s staement on televisin,he said,I do not know what is Anshan so i do not know what is the procedure to break Anna’s Fast. I request all of those who are reading my commments on this page,If this government failed to take decision today on to break Anna’s fast.For Future we will not vote for anybody.Those politician who will came to us for the vote, simply ask them to have a fast(anshan) of at least 5 days to be worthy to run this government. Let them know the experience of the poors which have to leave without food due to high increase inthe rates of food items and every thing. The income of one common graduate peron is just enough in the range of 10,000 to 15,000.00 per month.This MLA’S and MP’s which are elected by us, i think 10 to 20percentage of these are hardly graduates and earning 80000.00 per month and other Allowances exta. Mai Anna se puchna chahta hu ki maine 22 december ko loksabha ki gandi vichar dekhi. Jahan saari partiya indirectly Lokpal ko laagu nahi karna chahti aise me mere jaise log jo aapke sath chal kar in gande netaon ko sudharna chahte hein, hamare paas ab kon se raste hein? Kya hum saare desh ke logo ko ye sachchayi bata payenge ki rajnitik partiyan kitni gandi ho chuki hein? Deepak, Kisi ko to shuruwaat karni padegi. Anna ne ek shuruwaat kari, jiski wajah se aap aur mei iske saath jude. Ab aage aapko aur logon ko jodna hai. Logon tak baat pahunchani hai.